Explanation: Peering from the shadows, the Saturn-facing hemisphere of tantalizing inner moon Enceladus poses in this Cassini spacecraft image. North is up in the dramatic scene captured during November 2016 as Cassini's camera was pointed in a nearly sunward direction about 130,000 kilometers from the moon's bright crescent. In fact, the distant world reflects over 90 percent of the sunlight it receives, giving its surface about the same reflectivity as fresh snow. A mere 500 kilometers in diameter, Enceladus is a surprisingly active moon. Data collected during Cassini's flybys and years of images have revealed the presence of remarkable south polar geysers and a possible global ocean of liquid water beneath an icy crust. Yes indeed Boomer: A very nice catch by Cassini! A beautiful and stark image of Enceladus! Yesterday's "teaser" said that today's APOD would be "ski Enceladus". And I agree that Enceladus looks like a giant cosmic ski slope! Appears to be a reasonably young surface. And looks like the big end of an egg rather than spherical, or maybe that is just a trick of the light and the angle of things. I would have expected to see a hint of an atmosphere if there was one. It is still a great photo from across a great distance. Maybe just maybe ,being now at 63, I'll get to see whether or not there is an underlying ocean.I doubt it will happen in my lifetime but one can always hope. Water ice jets on Enceladus. Enceladus has indeed a young surface. 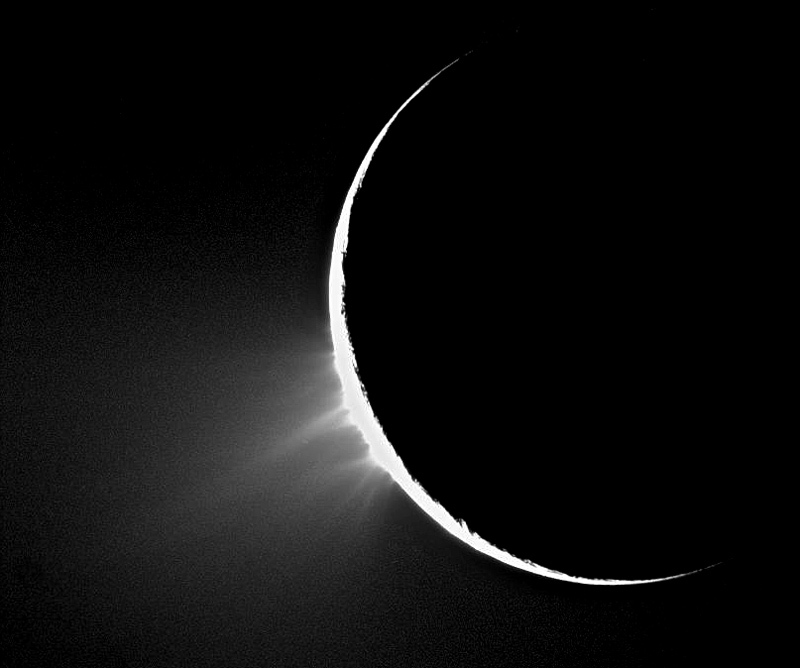 Water ice is continuously being released through jets from the south pole of Enceladus, and fresh ice covers much of the surface of this moon. Enceladus is a relatively small satellite composed of ice and rock. It is a scalene ellipsoid in shape; its diameters, calculated from images taken by Cassini's ISS (Imaging Science Subsystem) instrument, are 513 km between the sub- and anti-Saturnian poles, 503 km between the leading and trailing hemispheres, and 497 km between the north and south poles. That makes it enough out of round that it isn't even in hydrostatic equilibrium. But Enceladus is way too small to hold onto an atmosphere. Many objects far larger (such as our Moon) can't even hold onto atmospheres. Hydrostatic equilibrium for a rapidly rotating tidally locked moon is (to first order) a scalene ellipsoid. My source on saying that it wasn't in h.e. was a chart in Wikipedia titled "List of Solar System objects by size". On Enceladus this chart states, "round (not in hydrostatic equilibrium: frozen-in ellipsoidal shape)". Is it both rapidly rotating and tidally locked Art? I'm sure that would depend on what's meant by rapid rotation. Apparently, this moon was once rotating faster than it is today, and at a time when it was much less frozen than it is now. It must have frozen into an H.E. shape at that faster rotation. But now that its rotation has slowed down into sync with its orbit it must have an equatorial bulge that is too large for its rotation rate. Now though it is not massive enough to have the gravitational strength to pull itself into a more balanced shape. Is it both rapidly rotating and tidally locked Art? I'm sure that would depend on what's meant by rapid rotation. Apparently, this moon was once rotating faster than it is today, and at a time when it was much less frozen than it is now. It must have frozen into an H.E. shape at that faster rotation. But now that its rotation has slowed down into sync with its orbit it must have an equatorial bulge that is too large for its rotation rate, but it is not massive enough to have the gravitational strength to pull itself into a more balanced shape. Saturn's rotational period of 10h 34m so they are both probably spiraling out from Saturn. has thereby maintained an earlier scalene ellipsoid hydrostatic equilibrium shape. That's true... but some of these objects (including the Moon) do have exospheres, which is a form of atmosphere. Enceladus is probably too small to have a significant exosphere, although I don't think that's certain. With its outgasing, it could have gravitationally bound gas molecules near its surface.